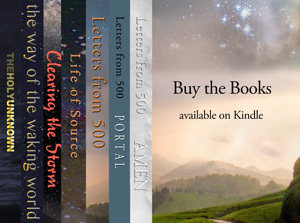 I have received from Robert the final chapters of Book Two, “Letters from 500 – Portal.” It is so profound that I find it difficult to put into words the feelings that welled up inside as I read these last two gems of consciousness. I felt my self wither away into a sea of greatness. There was no longer an identifiable person within the scope of my consciousness. Instead there was an overwhelming expression of being. I had become the tiny drop that enters the large ocean, and yet I have lost nothing of knowing. I have just become assimilated into the energy wave that emanates from Source. And now, there are no more words.